WHAT You ll receive a package of 100 12 x12 pieces of Cushion Foam Sheets. The sheets are precut, and does not require pulling apart like traditional perforated packages. Each foam sheet is made out of Expanded Polyethylene (EPE) foam. EPE technology allows a memory foam-like integrity that gives the ability to conform and reform. WHERE Storage. Fine China plates, unused kitchenware, Christmas ornaments, holiday decorations, small appliances, electronics, picture frames and etc. Moving. Wrap about furniture edges, to protect from scratching and chipping. Wrap up anything for cushion safe moving. Will keep integrity of the item, and dust free. Origami. Have at it! Let your imagination lead the way. HOW Cradle the object of your choice, and conform to shape. Sometimes, depending on the shape of the object, tape may assist. Depending on how big the item is, multiple sheets may be used. For flatter items that can stack, placing a sheet in between may be enough. WHY Provides stability as items are moved from one location to another, especially when inside a box. Provides cushion for the potential banging against walls and other items. Provides a dust free environment. Provides an organized, neat, and protective state. ABOUT US No matter what, we are consumers first and will always keep the consumers' mindset. Your satisfaction is #1 to us. If for whatever reason you are not satisfied, please contact and let us know. We promise to make it better. VALUE PACK - Pack of 100 count 12"x12" cushion foam sheets. Each sheet is made out of polyethylene foams. The sheets are PRE-CUT, avoiding the hassle of ripping perforated variations. EASY USAGE - Expanded polyethylene has a memory foam nature that is easily manipulated into desired shape. Therefore, the cushion foam sheets will easily conform to all edges and corners of desired wrap. In most cases, cushion foam sheets can be reused if under reasonable previous usage. 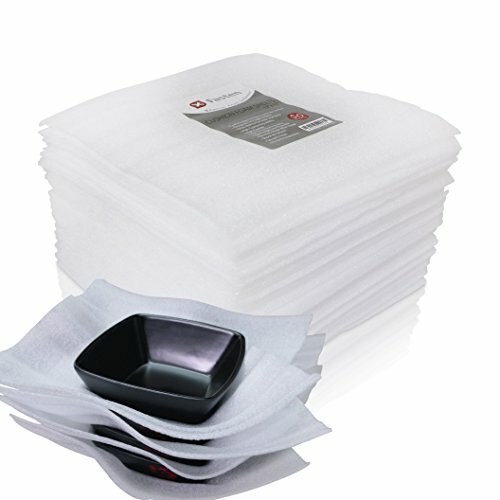 MULTI-PURPOSE - Use for PROTECTION of DELICATE and FRAGILE items such as: dishes, glasses, collectibles, kitchenware, etc. Use for STORAGE of any items ranging from small appliances to electronics that needs to be kept in same form and dust free. Perfect for moving as you can wrap table corners, chair legs, and furniture edges to prevent scratches and damage. SHIPPING items? Wrap it first. CONVENIENT - The Cushion Foam Sheets are low density. They are extremely light, yet strong. The foam sheets can be stored away easily in any area as they are space efficient. ECO-FRIENDLY - It is very important that the environment is protected. Our foam sheets are tested for 24 chemical compounds, and successfully tested negative for all 100%. RECYCLE. REDUCE. REUSE. These California Home Goods poly foam pouches are constructed from 1/8" thick low density polyethylene foam which is designed to cradle your product. These foam cushion foam pouches protect fragile items such as dishes, glassware, valuables, home decor, small knick-knacks, figurines, photo frames, and much more. They are a moving accessory essential! PROTECT YOUR VALUABLES IN THE MOVE: Forget the cumbersome packing paper! Ensure your belongings make it in one piece by wrapping your dishes, bowls, glasses and fragile items using our thick cushion foam sleeves before you pack them into boxes! 1/8 THICK FOR EXTRA CUSHIONING: Don't settle for competing products that sell a thinner foam with the same dimensions! They want you to believe you're getting the same quality product but you definitely are not! These strong lightweight foam sheets offer both the most protection and the most flexibility, making it easy to wrap virtually all kitchen items of any shape. PREVENT SURFACE DAMAGE: Wrap furniture legs and corners to protect from scratches during bumps in the move. These sheets are also great for precious collectibles, picture frames and glass objects. SAFELY STORE SEASONAL BELONGINGS: Keep your delicate Christmas ornaments or those special china plates and beautiful crystal wine glasses you only bring out for Thanksgiving dinner protected all year round while not in use. REUSABLE: Restack and keep them to be reused over and over. We guarantee the sheets will certainly come in handy again on another occasion. These California Basics poly foam pouches are constructed from 1/8" thick low density polyethylene foam which is designed to cradle your product. These foam cushion foam pouches protect fragile items such as dishes, glassware, valuables, home decor, small knick-knacks, figurines, photo frames, and much more. They are a moving accessory essential! MOVING WRAP FOAM POUCHES ARE YOUR ULTIMATE PACKING ACCESSORY. Worrying about your fragile home items is normal but never necessary. Using our foam wrap pouches with extra thick cushioning, all your glass decor, wine glass set, ornaments, furniture legs and huge mug collectibles have the perfect glassware wrap to protect them no matter how long and complicated the transit is. Take refuge in the fact that when you wrap dishes, bottles, or glasses with our packing cushion, they're safe and sound! WE VALUE YOUR SATISFACTION - California Basics is determined to make packing glassware and china so much easier for you. That's why we want to assure you that we are 100% confident in the quality of our packing foam sheets pouches. 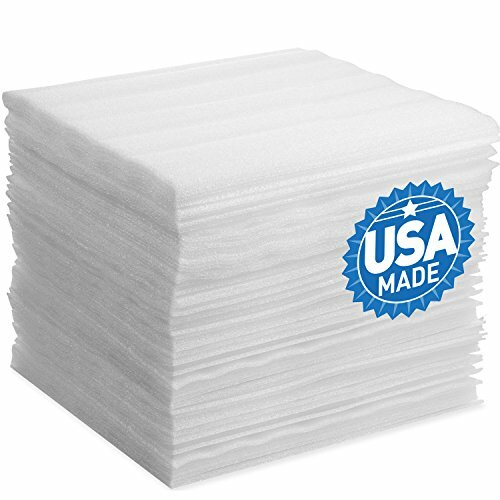 But in any case you're disappointed with your purchase of our foam pouches 50 pack, simply reach out to us so we can immediately improve your overall experience. FOAM SLEEVES PACKING CUSHION THAT CONFORM AND REFORM - Whether you need our cup pouches for moving as tea cup foam pouches, china foam dividers, bubble pouches, silverware pouch, wine gift box protector or furniture wrap for moving, they'll never disappoint! Our packing glass sleeves are flexible and conforming making it so easy to individually wrap huge wine glass decoration, knick knacks home decor and more. Best part is, after using, our foam wrap sleeves will go back to their original state. MULTI-PURPOSE CUSHION FOAM POUCH FOR REUSE - Besides being reliable packing supplies for moving, these less dense packing foam pouches won't lose their magic even after settling in your new home. You can store these foam pouches for packing until your next move, or you can use them to store seasonal decor, as gift or mail pouch, divider for ornament storage boxes, as china sleeves, glass plates divider in your cabinet, or silverware wraps. 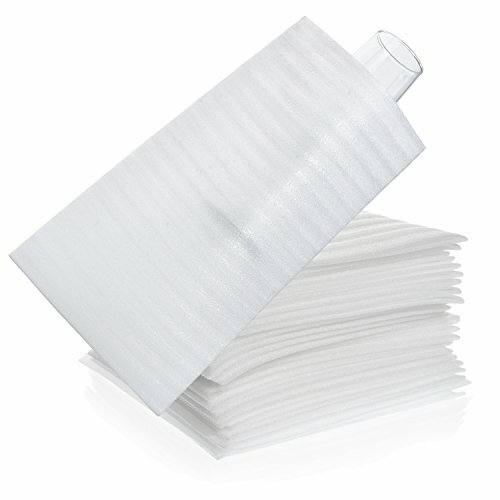 Store and use these foam cup pouches over and over! DOUBLE-SIDED NON-ABRASIVE FOAM CUSHION MOVING POUCHES - Not only do our foam cushion packing pouches are made from low density polyethylene and 1/8-inch thick cushion, they also prevent abrasion! The inner and outer surfaces of our glassware wrap sleeves act as guards for your precious items so they won't get chipped, scratched, or dented. 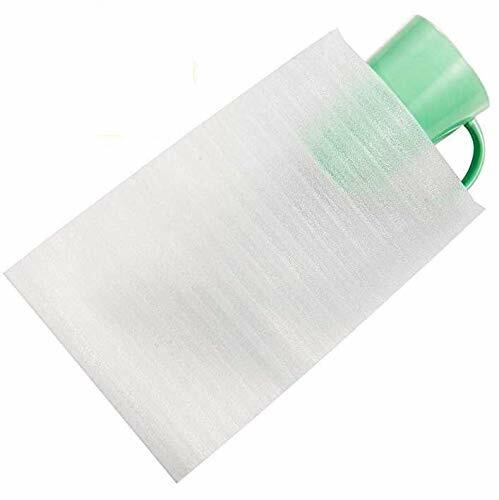 With our cup packing pouches, your glassware drinking glasses, glass cups, glass drinking bottle, painted wine glasses, knick knacks home decor are unharmed. 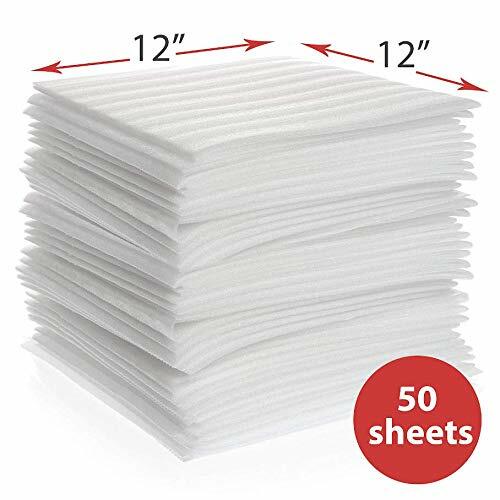 50-Pack Sheets Foam Cushion Sheets included (each sheet contains 12 inch x 12 inch). enKo lightweight foam wrap sheets can be used to wrap delicate items, such as glassware, china or dishes. They can also be utilized when wanting to protect legs or the corners of expensive furniture when moving. These sheets allow items to take bumps and dings without being harmed. Many individuals choose our foam sheets when wanting to store seasonal items, collectibles, picture frames, glass items and much more. It doesn t matter if you want to store your delicate items or ship a package. The end goal is to keep your items unharmed during the time they are in a package or being stored. Our foam sheets are designed with you in mind, as we understand what it takes to make materials that will protect your precious goods. These sheets are designed to naturally cradle your items and provide them with the best protection possible. Sometimes you just want to wrap a tiny item so that it does not get lost among other products in a shipment. Measuring 12 inch x 12 inch, we have made it possible to package a variety of items with ease. Foam sheets are non-abrasive, you will not have to worry about delicate items becoming scratched when wrapped with this material. Never worry about precious items being stored or shipped when you have enKo polyethylene foam wraps. Our foam sheets are designed to cushion your items, as well as protect them from dust and other storage elements. Designed for shock absorption, lessens vibration, provides surface protection, acts as thermal insulation and is resistant to water and other chemicals. PROTECTION FOR FRAGILE ITEMS : This Polyethylene Foam is a non-abrasive foam material acts as added protection and cushioning by cradling your products and absorbing any shock, vibration, scratches and dings. PERFECT FOR STORAGE, MOVING & SHIPPING : Protection for your fragile / delicate items such as dishes, collectibles, glass. It could also be used for wrapping furniture edges (corners & legs) to prevent scratches during moving / shipping. Safe for protecting electronics and small appliances as well. REUSABLE PACKING MATERIAL : These foam sheets are the perfect size for all types of products such as plates, dishes china and cups. Plus, they are easy to store and reuse at any time. Mighty Gadget (R) Cushion Foam Sheets - we know moving is stressful enough without having to worry about whether your belongings will make it to your new home in one piece, so we've produced foam sheets that provide enough cushioning to protect all your belongings. Our foam sheets work perfectly on both large items such as furniture legs and small items such as picture frames. Once you've moved you can use the cushioning foam sheets all year round to protect seasonal items like Christmas ornaments and delicate dishes. Our foam sheets are made from low-density polyethylene making them lightweight, flexible and strong. It's the perfect material for all your wrapping needs. These low-density polyethylene foam sheets provide perfect protections for your fragile & delicate items such as dishes, glasses and china. These strong light-weight foam sheets offer both the most protection and the most flexibility, making it easy to wrap items of any shape. Wrap furniture legs and corners to protect from scratches during bumps in the move or when shipping. Also perfect for collectibles, picture frames and glass objects. At California Basics we know moving is stressful enough without having to worry about whether your belongings will make it to your new home in one piece, so we've produced foam sheets that provide enough cushioning to protect all your belongings. Our foam sheets work perfectly on both large items such as furniture legs and small items such as picture frames. Once you've moved you can use the cushioning foam sheets all year round to protect seasonal items like Christmas ornaments and delicate dishes. Our foam sheets are made from low-density polyethylene making them lightweight, flexible and strong. It's the perfect material for all your wrapping needs. CONVENIENT ALL IN ONE PACKAGE: This listing is for (20) 7 3/8 x 7 1/2" pouches; (20) 11 7/8" x 12 1/8" pouches; (20) 12" x 12" sheets. Forget the cumbersome packing paper! Ensure your belongings make it in one piece by wrapping your dishes, bowls, glasses and fragile items using our best selling sizes thick cushion foam before you pack them into boxes! 1/8 THICK FOR EXTRA CUSHIONING: Don't settle for competing products that sell thinner foam with the same dimensions! They want you to believe you're getting the same quality product but you definitely are not! These strong lightweight foam sheets offer both the most protection and the most flexibility, making it easy to wrap virtually all kitchen items of any shape. PREVENT SURFACE DAMAGE: Wrap furniture legs and corners to protect from scratches during bumps in the move. These sheets are also great when you pack precious collectibles, picture frames and glass objects. RESUABLE: Restack and keep them to be reused over and over. We guarantee the sheets will certainly come in handy again on another occasion. BOXES 12"x50' Foam Wrap Roll. Protect Glasses and Fragile Items with Foam Wrap! Light Weight Alternative for Protecting Your Items! 12"x50' Foam Wrap Roll. Protect Glasses and Fragile Items with Foam Wrap! Light Weight Alternative for Protecting Your Items! Mighty Gadget (R) Cushion Foam Sheets - we know moving is stressful enough without having to worry about whether your belongings will make it to your new home in one piece, so we ve produced foam sheets that provide enough cushioning to protect all your belongings. Our foam sheets work perfectly on both large items such as furniture legs and small items such as picture frames. Once you ve moved you can use the cushioning foam sheets all year round to protect seasonal items like Christmas ornaments and delicate dishes. Our foam sheets are made from low-density polyethylene making them lightweight, flexible and strong. It s the perfect material for all your wrapping needs. You will receive 50 sheets of Mighty Gadget brand package cushioning foam sheets - Dimensions: 12x12 inch with 1/8 inch thickness. Buy them once and they can be reused over and over again. 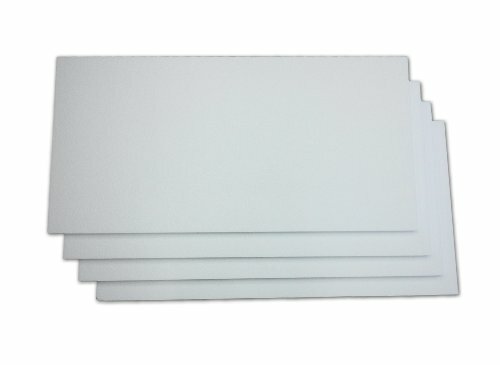 These thick low-density polyethylene foam sheets provide perfect protections for your fragile & delicate items such as dishes, glasses and china. These strong light-weight foam sheets offer both the most protection and the most flexibility, making it easy to wrap items of any shape. UBOXES Foam Wrap Roll 350' x 12" wide 1/16 thick Cushion - 12" Perforation. Foam Wrap 350' x 12" wide 1/16 Thick. Perforated every 12" for easy tearing. 350-feet long x 12-Inches wide. 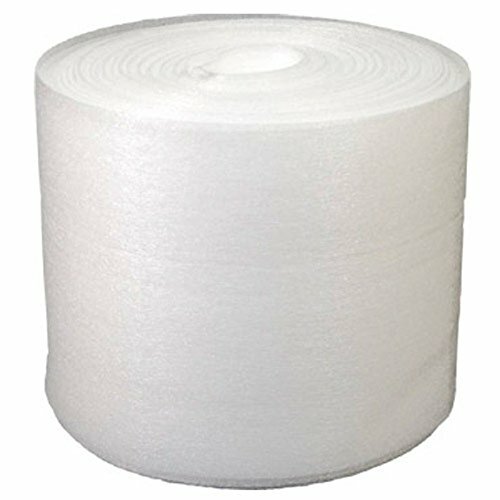 Foam Wrap 350' x 12" wide 1/16 Thick Perforated every 12" for easy tearing. California Basics is a homegrown brand that s committed to bringing you top quality products that provide ultimate convenience without compromising your wants, needs, and budget. We understand that moving and packing alone is stressful enough without having to worry about whether your belongings will make it to their new location in one piece. That s why we re bringing you the ultimate moving wrap material that will protect your belongings while in transit. 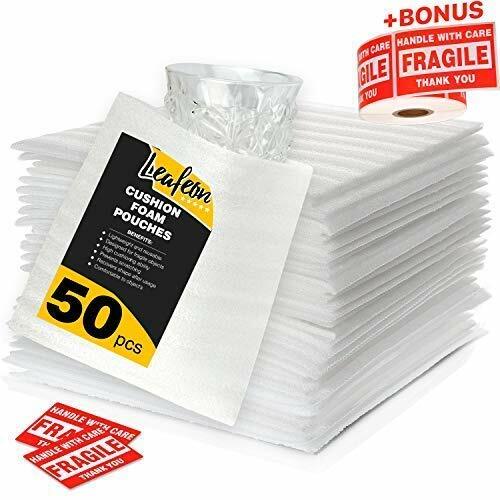 This value pack of white sheets contain 50 pieces of thick cushioning foam sheets that will perfectly protect both small and large items like wine glasses, dishware, table edges, collectors items, and fragile ornaments. These strong lightweight yet soft packing foam wraps offer both the most protection and the most flexibility, making it so easy to wrap items, protect furniture, and store fragile items. Each cushioning wrap sheet measures 12 x 12 inches and is 1/8-inch thick All 50 pieces of packing styrofoam sheets are made from thick low-density polyethylene (LDPE) making each foam wrap sheet a highly durable soft foam packing material Our protective foam packaging sheets are non-abrasive to protect glasses, plates and other fragile items from all forms of chips, breaks, and scratches These protective wrapping sheets are thick and durable that they make sure none of your precious items are left with any debris or residue Our cushioning foam wraps can also be used a million times over for all your glassware packing, furniture protection, gadget storage, kitchen packing, and other needs So whether you re moving into a new home, just about to settle down, or even sending some of your items away, there s no better protection for your belongings than these moving and packaging supplies from California Basics. Go ahead and add this pocket-friendly Cushion Wrap Sheets Value Pack of 50 to your cart now! 150' of foam wrap negotiations are settled and the contracts are signed. Closing scheduled in 60 days, and you simply can't wait to hold the keys to your new home! best feature, by far, is the office, lined with floor-to-ceiling shelving perfect to display hundreds of bowling trophies and souvenir bowling balls you have been awarded in your 40 years of playing the game. Since the age of 13, and in every home you have lived in since, your keepsakes have followed. Hopefully this new abode will be their final resting place. As always, you must handle these treasures with the utmost of care, which is why you never skimp on packing materials. Along with heavy-duty boxes, packing peanuts and wrapping paper, you are sure to stock up on rolls of bubble wrap that will ensure a break-free move. Once your moving supplies are lined up, you begin the painstaking process of rolling, wrapping, stuffing and securing each memento. Your wall of cardboard boxes are reinforced with shrink wrap to better carry the heavy loads. When moving day arrives, you are anxious to unpack your new haven while the rest of the family stakes claims to their own sanctuaries. The movers are attentive to the properly labeled "fragile" tape, and slow but steady, move your boxes in, one by one. When the day is done, you know you Scored the perfect game when all is unpacked with no broken pieces, and plenty of empty shelf space for the next 4 decades of bowling bliss! 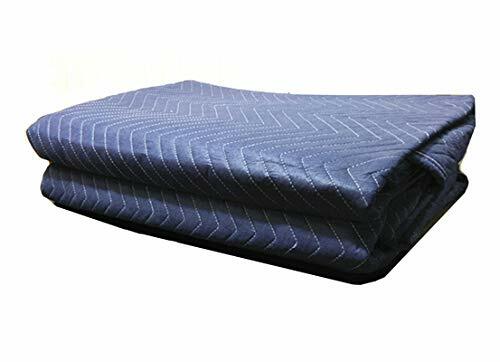 The XFasten Cushion Foam Sheets is the first ever packaging cushion that is build for rugged and rough terrain transit, thanks to its proprietary memory foam design which conforms to every corner and groove of your delicate belongings, giving your property an absolute protection from all sides of possible impact. We manufactured these packaging supplies to empower first time home movers, students, establishment owners and average American home owners in their packaging needs. 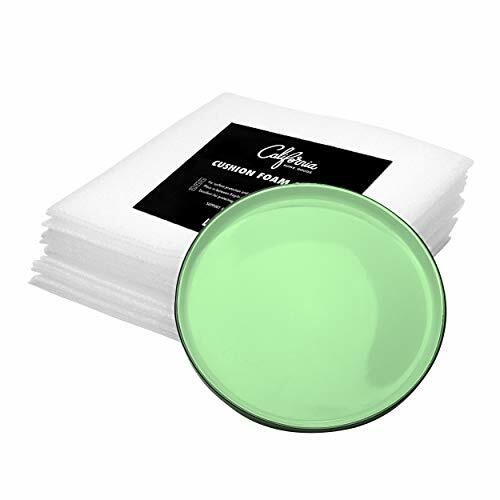 With the XFasten Cushion Foam Sheets, you are sure that your glassware, China plates, precious ornaments and even furniture will be protected from breakage, dust and abrasion while it is stored on transported. Why Choose The XFasten Cushion Foam Sheets? Sheets are rated to last up to 10 years and will return to its original cushioning power and shape every after use, thanks to its superior foam fiber arrangement. 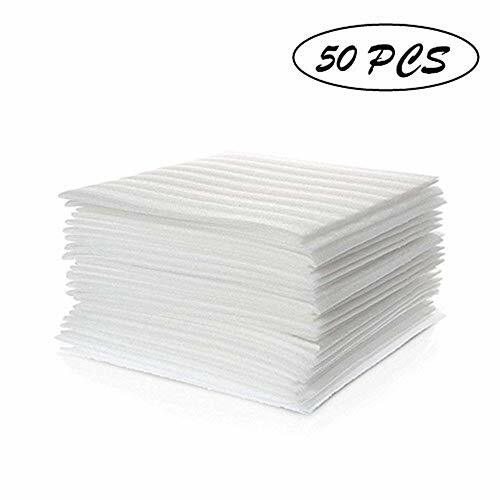 Comes in a pack of 50 at a fraction of the cost compared to other foam sheets! This is the most cost-effective cushioning sheet on Amazon. Shields your belongings against dust and abrasion, making this sheet perfect for storage of Christmas ornaments, decorations and other precious wares that are occasionally used. Provides extreme shock and vibration cushion to your wares, allowing you to move without any fear of breaking your belongings, even on rough terrains! 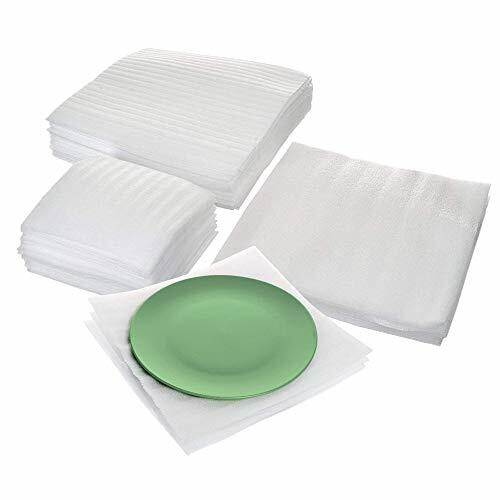 Shock absorbent and abrasion resistant cushion foam sheets that are made to take a beating and protect your glassware, dishes, porcelain, and China wares while being stored or transported especially on rough terrains. EMPOWERS AMERICAN HOMEOWNERS. Proprietary foam memory technology perfectly conforms to your items' shape- enabling reinforced protection. This packaging cushion is manufactured for home movers, students, establishment owners and AVERAGE AMERICAN citizens who want to store or transport their breakable items without any worries. Rated to last for up to 10 years, returning to its original shape and cushioning power every after usage, ENABLING it to be REUSABLE even after months of use. Keep your delicate Christmas ornaments, China plates and other breakable items dust free and in pristine condition with our packing supplies. Foam memory technology allows this cushion foam to absorb a lot of energy, enabling the sheet to be flexible and elastic for extra cushioning on bumps and rough terrains. Avoids breakages, scratches and cracks. XFasten is a certified US Trademark brand, which means that not only your precious belongings are protected, your purchases are guaranteed for satisfaction too. We will exhaust all possible means to make you satisfied and happy with your purchase from us! VARIETY PACK: (20x)12"x12" (20x)10"x10" (20x)7.5"x12" A variety pack makes your decision quick and easy. 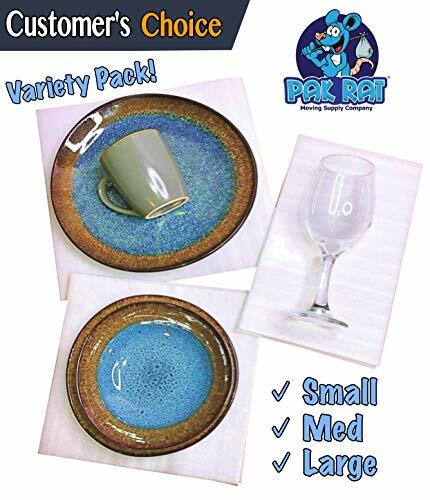 Whether it's plates, bowls, glasses, or other valuables we have ALL-IN-ONE package for you! No matter what size needed you will have the best protection! WHY POUCHES: Foam sheets cannot wrap all the way around an item leaving them vulnerable to damage. Having pouches wraps all the way around for the best protection without taking up a lot of space like bubble wrap or packing paper. It's a quicker, easier, and more cost-effective way for protecting fragile items. THICK FOR BEST PROTECTION: Don't settle for anything else, for the perfect amount of cushion and great protection overall with the easiest packing you need 1/16 EPE foam. It's not too thin, not too thick, but just right! WATER RESISTANT, STATIC-FREE, AND SHOCKPROOF: When storing or moving items there are other elements that are a factor also, with Pak Rat brand you get the peace of mind that your items are safe from any type of moisture build up, mold growth, or static build up which can be a fire hazard! NON-TOXIC AND ENVIRONMENTALLY SAFE: All Pak Rat Brand Products are Non-Toxic, safe for the environment and recyclable. Don't settle for competitor's low-quality hazardous products that can be a health concern for you or your loved ones. Our Foam Pouches are made with high-quality Low-Density Material! Brand: Pak Rat Moving Supply Co. | Manufacturer: Pak Rat Moving Supply Co. MAXIMUM PROTECTION: Our foam cushion sheets are made from a low-density polyethylene (LDPE) so these strong light-weight foam wrap pouches provide both great protection and flexibility, making it easy to wrap items of any shape. GREAT DIMENSIONS for Packing Moving Shipping & Storage Supplies: 12" x 7" size and 1/16" thick polyethylene (pvc) foam pouches, double thickness compared with others 1/8". SUPER CUSHIONING: Leafeon moving pack wrap pouches have high cushioning to protect all your fragile items. EXTRA SECURITY FOR SURFACE: Double sided, 1/8" thick cushion sleeves keep off the bumps and scratches while moving. REUSABLE: You can use our 50 Pcs packing pouches all year round, over and over again. People widely use our cushion glassware wraps to protect dishes, mugs, plates, porcelain and other fragile items while moving. Also for safely storage precious collectibles, picture frames, glass objects, packing dishes, sending fragile items, furniture legs & corners, Christmas ornaments, china plates, fragile cups, crystal wine glasses, mailing, mugs etc. Cushion wrap pouches are widely used compared with other packing supplies as roll wrapping paper, shrink wrap, bubble cushioning wrap, packing peanuts, plastic wrap, air pack, stretch wrap, boxes for moving, pallet wrap, air wrap, shipping boxes, corrugated wrap. We give you FREE BONUS - Fragile Stickers for safe shipping packing of items with a large lear print and strong adhesive backside! You can use it for marking your fragile items and fixing it. Buying our Foam Packaging Wraps you can be sure in 100% result! UMBERSOME BUBBLE CUSHIONING WRAP ANNOYS YOU?? PACKING PAPER QUICKLY GETS WET AND EASY TO TEAR?! WE RECOMMEND A GREAT ALTERNATIVE - CUSHION WRAP POUCHES. Also cushion foam wrap pouches are widely used compared to other packing supplies as wrapping roll paper, shrink wrap, plastic wrap, stretch wrap, boxes for moving, pallet wrap, air sheets, corrugated wrap. 1/8 THICK FOR EXTRA CUSHIONING: Don't trust other products that have thinner foam with the same dimensions! Our large perforated 12 x 7 inches cushion foam sheets provide the absolute protection, wrapping almost all fragile items of any shape. 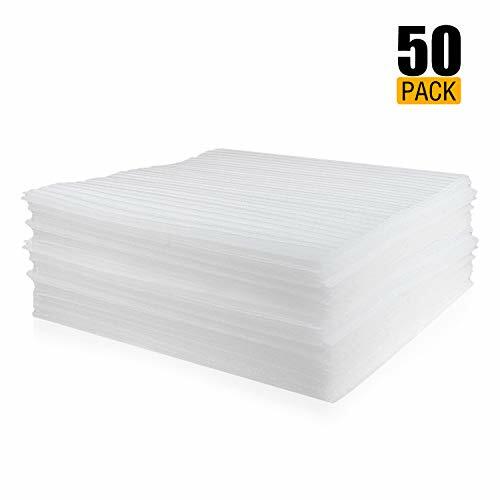 50 pcs wrap foam packing pouches are THE BEST PACKAGING MATERIALS FOR STORAGE, MOVING & SHIPPING! LIGHTWEIGHT, RESISTANT & REUSABLE: Cushion packaging wraps are made of thick but low density polyethylene (pvc) foam rolls, light and durable. 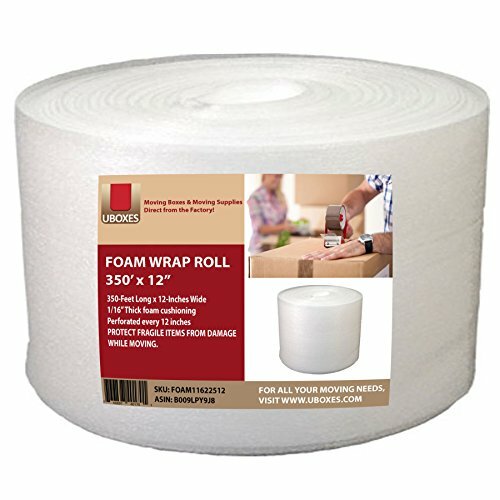 Our foam glass wrap for moving is easy to store and use over & over again. People WIDELY USE our foam cushion glassware wraps to protect mugs, dishes, plates, porcelain and other fragile items while moving. Also for safely storage precious collectibles, picture frames, glass objects, packing dishes, sending fragile items, furniture legs & corners, Christmas ornaments, china plates, fragile cups, crystal wine glasses, mailing, mugs etc. MAXIMUM PROTECTION: Our foam wrap sheets are made from a low-density polyethylene (LDPE) so these strong light-weight cushion foam pouches provide both great protection and flexibility, making it easy to wrap items of any shape. GREAT DIMENSIONS for Packing Moving Shipping & Storage Supplies: 12" x 12" size and 1/16" thick polyethylene (pvc) foam pouches, double thickness compared with others 1/8". EXTRA SECURITY FOR SURFACE: Double sided, 1/8" thick foam cushion sleeves keep off the bumps and scratches while moving. People widely use our foam cushion glassware wraps to protect mugs, dishes, plates, porcelain and other fragile items while moving. Also for safely storage precious collectibles, envelopes, picture frames, glass objects, packing dishes, sending fragile items, furniture legs & corners, Christmas ornaments, china plates, fragile cups, crystal wine glasses, mailing, mugs etc. Buying our Packaging Wraps you can be sure in 100% result! UMBERSOME BUBBLE CUSHIONING WRAP ANNOYS YOU?? PACKING PAPER QUICKLY GETS WET AND EASY TO TEAR?! WE RECOMMEND A GREAT ALTERNATIVE - FOAM WRAP POUCHES. Also cushion pouches are widely used compared to other packing supplies as roll wrapping paper, shrink wrap, plastic wrap, stretch wrap, boxes for moving, pallet wrap, air wrap, corrugated wrap. 1/8 THICK FOR EXTRA CUSHIONING: Don't trust other products that have thinner foam with the same dimensions! Our large perforated 7.5 x 7.5 inches cushion sheets provide the absolute protection, wrapping almost all fragile items of any shape. 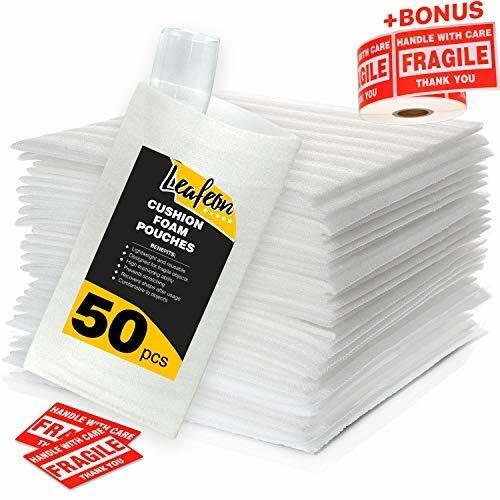 50 pcs foam wrap pouches are THE BEST PACKAGING MATERIALS FOR STORAGE, MOVING & SHIPPING! 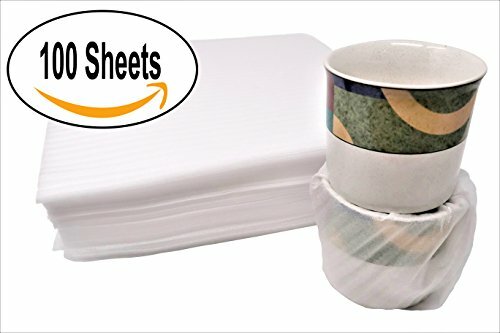 People WIDELY USE our cushion glassware wraps to protect mugs, dishes, plates, porcelain and other fragile items while moving. Also for safely storage precious collectibles, picture frames, glass objects, packing dishes, sending fragile items, furniture legs & corners, Christmas ornaments, china plates, fragile cups, crystal wine glasses, mailing, mugs etc. 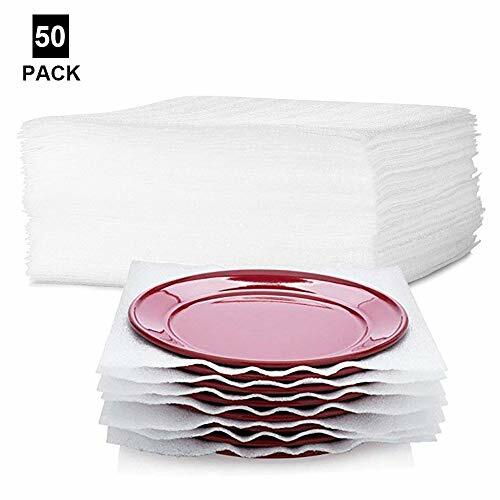 50-Count Packing Supplies Cushion Foam Sheets Safely Wrap to Protect Dishes China Glasses Plates Fragile Items for Moving Boxes 12" x 12"
- Protect fragile & delicate items such as dishes, plates, glassware , china, etc. SOFT AND REUSABLE : These cushioning foam sheets with 1 mm thickness, soft and flexile, making it easy to wrap items of any shape. They regain their shape easily, buy them once and they can be reused over and over again. 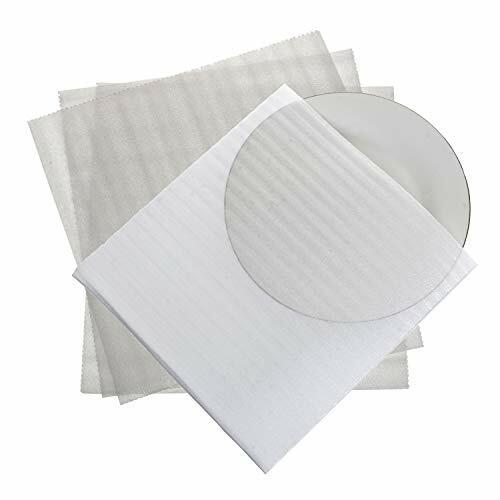 PROTECT FRAGILE ITEMS : These polyethylene cushion sheets absorb shock, vibration, scratches and dings and provide perfect protections for your fragile & delicate items such as dishes, plates, glassware , china, etc. Great for packing or moving to protect your fragile items, such as glasses, dishes vases etc. 1. Protect fragile & delicate items such as dishes, plates, glassware , china, etc. Are you tried to see your dishes, glasses and other valuables break? Let's put an end of this. We have the perfect solution for your problem: We present to you Cushion Foam Sheets that can perfectly wrap your fragile items (even larger ones like vases, paintings and others). Our Cushion Foam Sheets will save you a lot of money, because they will protect your much more expensive items of breaking. They can also be used for wrapping your Christmas ornaments when you put it back in the box for the following year. Protecting Your Furniture During Move. Wood Table Bed Chairs Hutch Wine Rack. THE ULTIMATE MOVING PROTECTION FOR YOUR PRECIOUS BELONGINGS: Protecting your valuables on the move is never a pain when you have this Cushion Foam Pouches. Using these thick styrofoam wraps made from thick, strong, and low-density polyethylene foam, you're sure all your belongings will make it to their new location in one piece. Our cushion foam pockets ensure that while no item is unmoved en route, your items will remain its perfect shape - free from dents, cracks, and breaks. REUSABLE MOVING SUPPLIES FOR YEAR-ROUND PROTECTION: Don't be afraid to use up all 50 of these amazing moving supplies foam pouches because they'll certainly come in handy again on another occasion. Once you've completed your move, use these cushion packing sleeves all year round to protect seasonal ornaments, your precious china, or fragile collectibles. When not in use, simply lay the foam protective wrap sheets flat and re-stack them inside your cabinet or drawer. 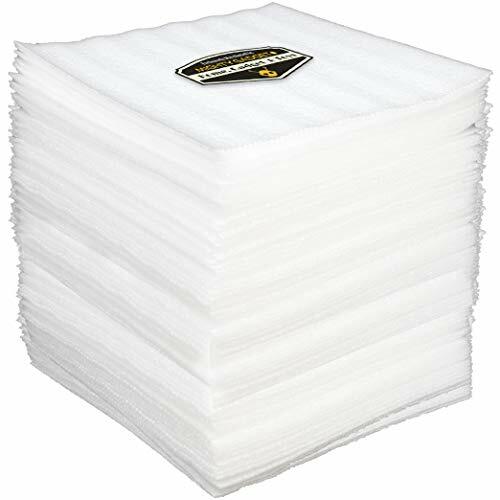 SOFT YET DURABLE DISH SLEEVES: Packing fragile and delicate items is now way easier with our foam packing sleeves because these foam wraps are not only thick but also soft and flexible. 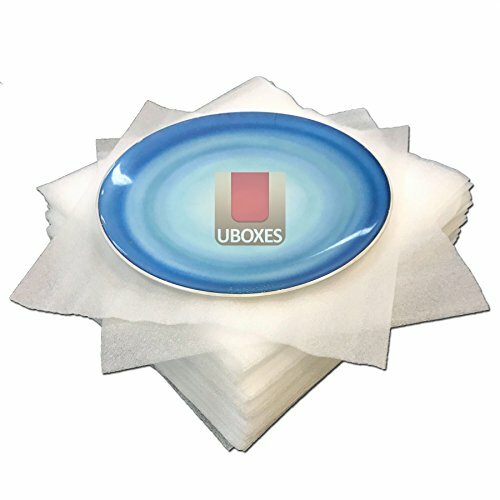 Get peace of mind and use them freely as crystal glass packing sheets, china packing protectors, appliance edge cushion, small gadget wraps, wine glass wraps, mailing foam, ornament protectors, plate separators for moving or storage, collectibles storage foam, table legs cushion protectors, and more.